Australian Lowline Angus cattle, small beef cattle. Australian Lowlines,which come from pure Angus stock with pedigrees tracing back to the origins of the Angus breed, are one of only three breeds of cattle in the world with a closed herd book. Line bred to retain the original Angus size,they mature at about two thirds of the size of their huge modern cousins and offer many advantages for small acreage farmers. 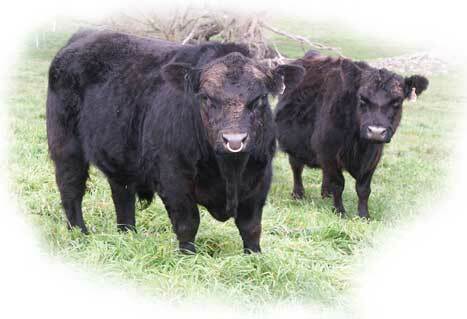 Lowline bulls also provide exceptional hybrid vigour. Australian Lowline cattle are small and beefy Angus cattle, scientifically developed in Australia for low birth weights, stocky bodies, early maturity, an extremely high dressing-out ratio, and a higher percentage of quality cuts. More beef to the hectare Because they're such good doers, and of blockier build than traditional Angus cattle, Australian Lowlines produce around 40% more beef to the hectare than other beef cattle. Very tender And there's a bonus in the beef. It's finely grained and even more tender than the Angus beef we already enjoy. Dairy farmers.. easy calving. When you use Australian Lowline bulls as terminal sires over your valuable dairy heifers, you can expect smaller calves and easy and unassisted calving. Increase milk yield Because the Lowline gestation period is shorter (average 273 days), you'll get up to 10 days more milk from your cows... for FREE. Lifestyle block farmers will appreciate the easy handling of Australian Lowline cattle, which are about 60% of the size of a traditional Angus cattle beast. Bulls are around 110 cm at the hip and cows 100 cm. Placid, easy going Australian Lowline cattle are a pleasure to farm. They're easy on your fences and easily handled by women. Although small, they're serious beef cattle descended from some of the world's best Angus cattle. Your friends will be amazed at the quality of your home grown Australian Lowline Angus beef. The quality of Lowline and Lowline cross beef has been repeatedly proven by carcass contest successes at Australia's major Royal shows. At Queensland's famous "Ekka" crossbred Lowlines won lightweight, heavyweight and Supreme Champion carcasses one year, something that has never ever been matched by any other breed or breeder in Queensland or at any other Royal Show. In achieving these prizewinning crosses, Lowline bulls serve cows as big as Brahmans. They are also long lived and virile. The famous Australian Lowline "The Glebe Woodstock" was still serving cows at 19 years of age. Judy and David Sainsbury, Casablanca Lowline Stud, 16 Haunui Rd, Whangaehu, Wanganui, New Zealand.